Clockwise from top left: Elina working on her story about the pain of broken friendships; George listening to his soundtrack for his piece about basketball; Veronika selecting images for her story about her uncle Viktor who was fell out of touch with his family for 25 years; and Alina composing a story about her brother Chingiz, who drowned when he was teenager. Their assignment to finish our digital storytelling class is a 2:30-3:30 minute story from their lives. They are to tell the story using images, sound and voiceover. It is to be a story that pulses inside them and a story that has a universal theme. So they tell of love and of loss, of failure and of heartbreak, of reaching and of family. Their candor inspires me, and their stories remind me that we are all the same, all of us, from all over this wild and woolly world: We grieve. We try. We love. We lose. We honor those who came before us. We strive to become as whole as we can. We lurch toward making sense of it all. The deadline for this final project is tomorrow. 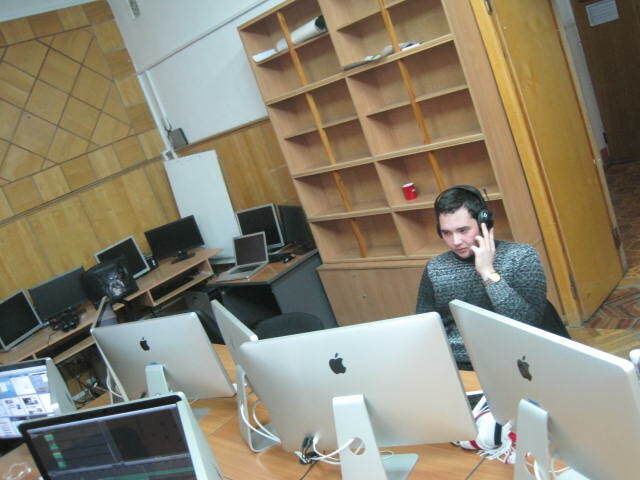 This morning, a Sunday, I walked at 9:30 through empty and icy city streets to the university and opened the media lab. 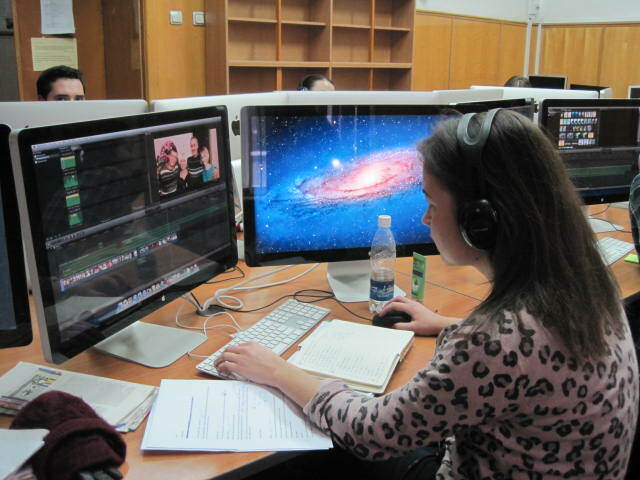 I stayed for six hours, pulling up my chair beside each one to listen, to guide, to critique, to edit. I pulled up my chair to be near them, to hear them speak their stories. I pulled up my chair to honor them, to encourage them and to say to them that their stories have meaning and depth and importance. And they do. 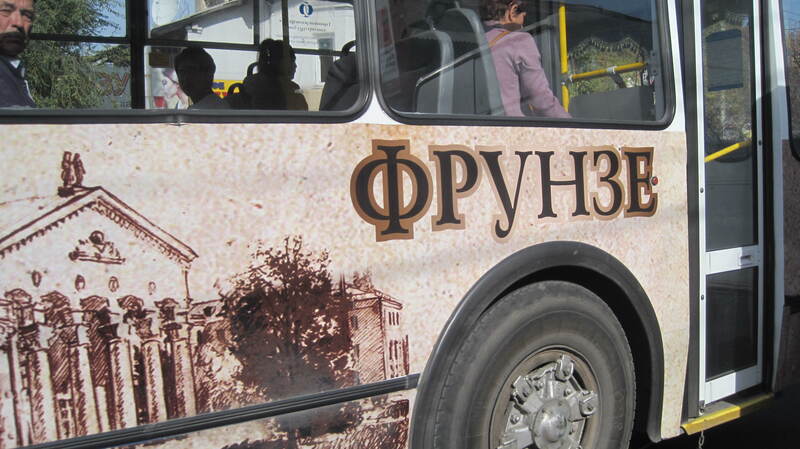 I leave Bishkek in two weeks when this fall semester ends. Today was better than any farewell party I could conjure. Today we worked together, which is what drew me most to teaching journalism. To work with the work is the doorway into the deepest and most satisfying connection I can make with a student. And through these stories I see into their lives and into other worlds. 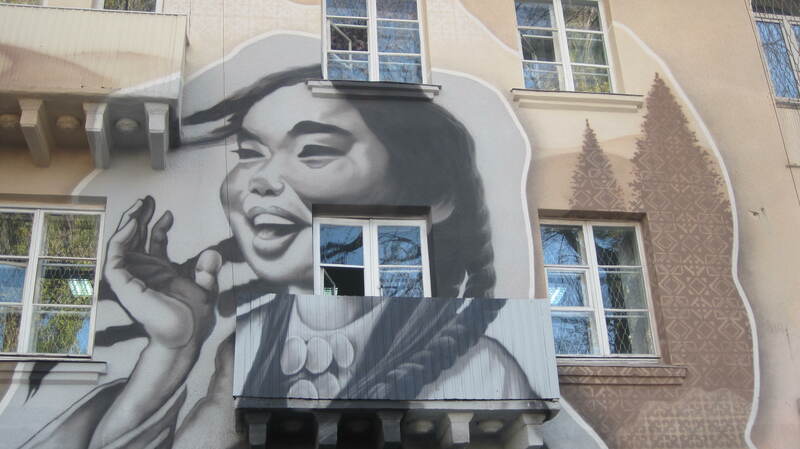 She is three stories tall on Chui and Logvinenko, my first Bishkek neighborhood. Inside is a shiny new Kyrgyz Concept store. She reminds me of Chip Thomas and the Painted Desert Project back in northern Arizona in the Navajo nation. 28 days until I leave Sugar Town. My heart is open and tender. 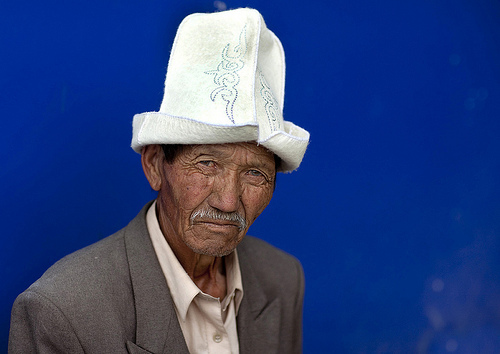 Headdress is an indispensable attribute of a married Kyrgyz woman. It sits tight on the head and completely covers the hair. 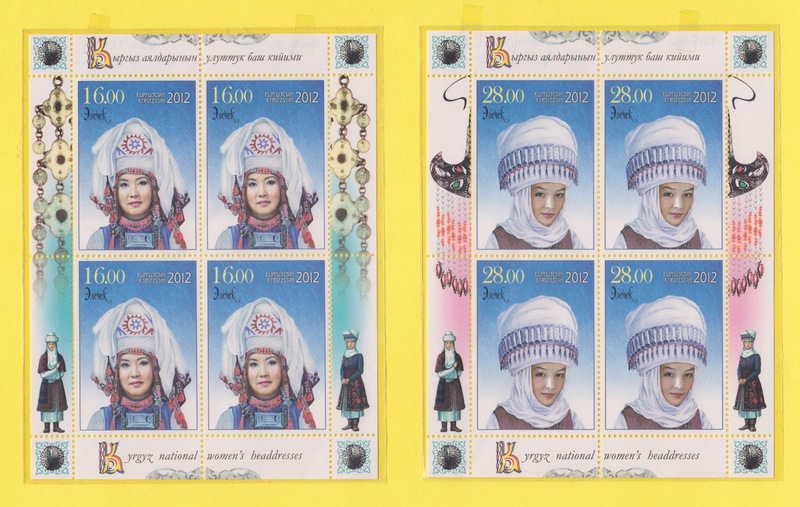 The headdress is decorated with ornaments made by various types of seams with colored threads. 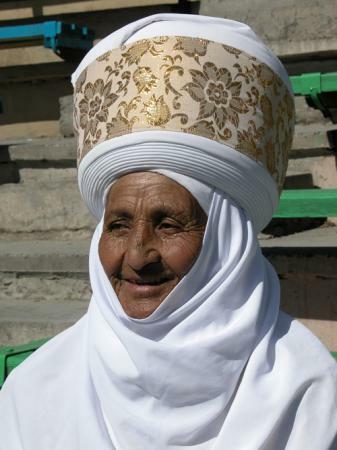 A turban of white material called an elechek is always worn over the hat.